Good energy reading for the beach? I used to spend the week between Christmas and New Year’s Eve with my in-laws in Portland, Ore. A couple years ago, it snowed for two days straight, and the city shut down. My brother-in-law has taken it upon himself to find a warm-weather holiday destination for the family ever since. As I head for the beach, I’d love guidance on good reading material. For starters, below are a couple books I’ve come across or that colleagues have recommended. The Boom: How Fracking Ignited the American Energy Revolution and Changed the World, by Russell Gold. I’ve gotten a lot of endorsements for this. Colleagues claim it is very well written and a thorough treatment of fracking, including technological, environmental, economic and social aspects. Gold is an energy reporter for the Wall Street Journal. Unreal City: Las Vegas, Black Mesa, and the Fate of the West, by Judith Nies. My husband just finished this – kind of the energy version of the movie Chinatown (which I’ve watched, so won’t be downloading for the trip – I recommend it if you have not seen it). It describes the politics and business deals that unlocked 21 billion tons of coal on the Navajo and Hopi Reservations to bring electricity to Las Vegas, Phoenix and Los Angeles. The Boy Who Harnessed the Wind: Creating Currents of Electricity and Hope, by William Kamkwamba. This is an autobiographical story about a boy in Malawi who built a windmill from scratch to bring energy to his village. He is discovered by NGOs and reporters and eventually invited to do a neat TED talk/interview. Again, multiple recommendations for this. Why Nations Fail: The Origins of Power, Prosperity, and Poverty, by Daron Acemoglu and James Robinson. 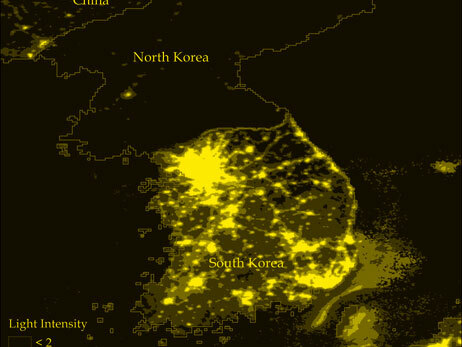 This is not an energy book (the power in the title is a synonym for “might” on the world stage), but I had to put it on the list as Lucas Davis pointed out that some of their best evidence comes from comparing electricity/lighting use between S. and N. Korea. I love world-at-night pictures, and this one is impressive. Any thoughts, loyal blog readers? If you’ve read these books, which would you recommend? Any others to add to the list? I debated adding The Prize, by Daniel Yergin, but (a) I’m the lone holdout in my family and don’t own a Kindle, so I can’t imagine lugging that to the beach, and (b) I have read parts of it already. « Is Putin out to destroy the EU? Thoughtful writing . I am thankful for the points . Does anyone know if I can get a sample IRS 1120S version to fill in ? I hope that you have already read my recommendations, for they are by two well-known authors and have been much discussed by those of us who depend on books, not the internet, for mental stimulation. “The Rational Optimist,” by Matt Ridley, has been endorsed by the likes of Ian McEwan and Steven Pinker. If it doesn’t change someone’s thinking at least a smidgen, I suspect we have a fundamentalist on our hands (probably of the left-wing variety). Many books by Freeman Dyson (the subject of a recent biography entitled “Maverick Genius”) are worth reading, but I’ll mention just two: “A Many-Colored Glass” (U. of Va. Press) on biology, climate change (he’s a heretic on the issue, which means he’s open-minded), evolution, and humankind’s place in the biosphere. Elegantly clear prose. Finally, a new collection of pieces he wrote for The New York Review of Books, entitled “Dreams of Earth and Sky.” The topics dealt with are too many to list. “The Boy Who Harnessed the Wind” just earned an engineering degree from Dartmouth this year…. This article based, partly, on Berkeley research was linked on the campus home page the same day as Catherine’s blog post about how she enjoys her semester breaks.